TV Girl: Review: "Michael Clayton"
Here is a movie difficult to come by: a crime thriller that attacks from the get-go, scrambles your insides, and then, as cool and calculated as Hannibal Lector, unfolds into something so much subtler, something personal and almost invasive, that by the end, it has transcended a genre. "Michael Clayton" is about a man. It involves a lot of lawyers, a lot of jargon, a lot of black suits and clicky heels, but, in all of its legal-minded glory, it's about a man. George Clooney generates an unforgettable performance as the film's title character, Michael Clayton, a divorcee and major "fixer" for the prestigious New York law firm Kenner, Bach, and Ledeens. Clayton is a maven, a connector of dots, eraser of mishap, and swindler of information. As a former DA, he can spin the English language like a ball of yarn. He knows people who know people in all fifty states, and if your deal is deal-able, he can hook you up with a neatly wrapped case as soon as he makes a few calls. 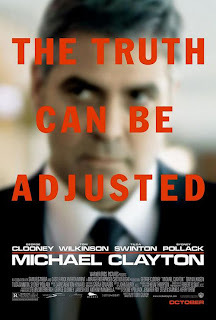 During one illustrative point in the film, an anxious client berates Clayton, calling him out, claiming to have been told that Michael Clayton is a "miracle worker." Unflinching, steeped in reality, Clayton then replies, "I'm not a miracle worker. I'm a janitor." The movie begins with the crazed ranting of Arthur Edens, a senior partner at Kenner, Bach, and Ledeens, and ruthlessly portrayed by Tom Wilkinson. It then spins into a plot that seems pointless to describe, because it is not the plot that should drive you to the theater, and it is not the plot that drives this film, but it is the characters and their erupting fears, their strange self-loathings, and unattainable needs. I will, however, give it a go. The plot involves influential K, B, and L client U North, a fertilizer company that has been furtively poisoning its customers to cut costs. The case specific to the film is a $3 billion law suit involving a Wisconsin farm family claiming to have lost lives to U North's hazardous product. It has been on the table for eight years, wreaking of guilt from all angles but lacking hard evidence. Inconveniently for U North, however, prominent defense attorney on the case Arthur Edens (Wilkinson) has procured a well-hidden memorandum quoting scientific back-up for U North's poisonous ways. He has also stopped taking his medication. For, you see, Arthur Edens is a manic depressive and, as you would have it, a damn brilliant man. With the necessary paperwork at hand, Edens has begun to build a case against his own client. He lets his illness get the better of him, however, at a Milwaukee deposition in which he strips to his socks before running naked into the parking lot, ranting about things like truth and assholes and blackness and cold, hard injustice. His temporary insanity prompts K, B, and L to send in firm janitor Michael Clayton to not only contain the situation with Edens, with whom he is quite close, but also to assist U North Chief Council Karen Crowder (Tilda Swinton) with necessary adjustments. The film then becomes a breeding ground for deception. Things happen that you'll expect, and things will very well surprise you. You may find yourself laughing at inappropriate times, or staring wide-eyed during others. It all depends on you. There will be no question, however, no matter who you are, as to how hard this film will grip you. And it doesn't really matter how bad I boggled that plot description (not THAT bad), because the most important part of this movie is not its notoriously legal-minded plot, but its incredible, INCREDIBLE performances. I'll be quite blunt when I say: I absolutely loved "Michael Clayton." And I didn't love it because of its writing (which, however, is brilliant) or its twists and turns (which, conveniently, are brilliant as well); I loved it because of the flawless, heartbreaking performances of Tom Wilkinson, Tilda Swinton, and George Clooney, all of which have been nominated for Oscars, all of which deserve far more than a tall, gold statuette. I will go as far to say that, while I certainly believe that "No Country for Old Men" is the superior film, performance wise, "Michael Clayton" positively trumps the McCarthy adaptation--hands down, no holds barred. God knows I love the face on Javier as he stabs the brains out of unsuspecting truckers, but next to George, it's hardly worthy. If I stand alone or, by all means, corrected, let me know why. I simply feel that "Michael Clayton" is an incredibly smart, well-acted, flawlessly directed (see Tilda's interview scene to understand what I mean) crime drama, and yet, it is so much more. It's an introspective look at an unsuspecting hero, Clayton, whose personal life is not quite as shiny as his company lease Mercedes, and whose down-to-the-wire decision making, his subtle nudges toward humanity, lay groundwork for a breathless and stunning film. So, congratulations, George. And who cares if Day-Lewis beats you come 2/24. You just get yummier with age, and I have to admit, I like your style.